I was present at a festival of resurgence and determination a few days ago. 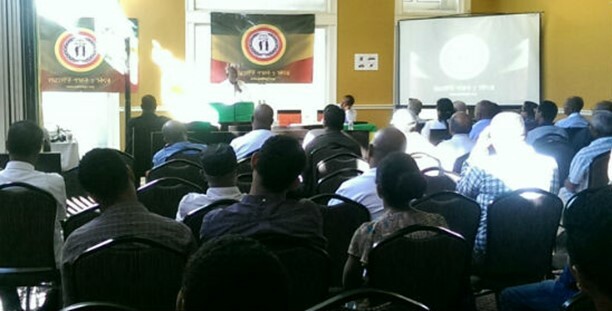 The program was organized to show appreciation to Arbegnoche Ginbot7 Movement’s determination to liberate our country from the grip of TPLF/EPDRF dictatorship. It was a bright California day and it felt like Enkutatash. What was missing was a blanket of Meskel flower coving the East bay hills. Unlike other gatherings I went to this one was a little different. The people that organized the event and the folks that showed up to attend were there to celebrate our new style of practicing the ‘Art of Self Defense’ not to sit around a table and recite the evil doings of the shameless gangster regime. The atmosphere was that of a weeding not a wake (Lekso Bet). I was perfectly fine with that. There are over twenty thousand Ethiopians in the greater bay Area where we live. Most of these people are here because the group that is in charge in Ethiopia is not really interested in making our home a safe and sound place to live and raise a family. Some choose to flee rather than die. This is the reason we have mastered the art of getting up and leaving with nothing but our shirts. It is common in our community for people to leave without notice. East Coast, West coast, the South or the Mid West it really do not matter, it is not like the real home. Sure after a while any place is home but there is no way of forgetting the highland on the horn. No one I know left his country because they are curious about the outside world. We left because there is no future in our homeland. We got our education and stayed because our home is always on fire. We leave because knowing tomorrow would be better than today is an important human condition and that is absent in Ethiopia. All politics is local. The young Ethiopians that set up this event decided to do what they could to help their people that have resolved to fight on their behalf. The truth of the matter is that many thousands have already sacrificed for the cause and the current attempt is building on that tradition of doing everything to save the motherland. I said twenty thousand people of Ethiopian origin at the beginning, you really did not expect for all those to show up did you? That only happens in Woyane supervised elections or in North Korea. There are a million and one reason people are unable to be present in person. So the organizers were very accommodating. Tickets were sold ahead of time to those that choose to buy and also donate whatever they could. Those that showed up made up for those that had prior commitments or are just not interested. The few, the beautiful the patriotic Ethiopians made all of us proud. The meeting Hotel was very charming Inn with beautiful hand carved entry and and large windows making the hall bright. It filled up in no time. The few proud Ethiopians poured their heart out. It is not due to the oratory of our speakers, the smart presentation of the organizers or the bright California sun that made our people respond in such a generous manner. It is all about the cause of freedom and Democracy for our people. They felt the need to help. It is always a few that echo the cry of their people. The event organized by the young people of Oakland and San Jose was a perfect example of the power of the individual working with a few friends to be able to make a difference. They say every chain event starts with one push our young people were acted as a catalyst to start the long process. The gathering accomplished a lot of goals that were set up. The invited guests explained the current situation and the goals of the organization. The case for engaging Woyane in a new manner has become obvious to most Ethiopians. We are hopeful people and we waited hoping our Masters would see the folly of their ways and change course. By now most Ethiopians have come to realize that would not happen unless force is used. That is the reason for the positive vibrations around the event. No one wanted it to fail. There is no doubt in our mind and heart that the road we are travelling today is the right one. We watched the misdeeds of the single ethnic regime for a long time. We tried different approaches to make the regime understand that its ways are not lasting. Today we have decided too much time has been wasted hoping someone somewhere would realize the zero sum of the game they are playing. Our fundraising was to make the job of those that are determined to do what is necessary to clean house a little easier. Of course we knew it was inevitable that they would come up with some bizarre scheme to take our eyes of the prize. It never fails. Molla Asgedom was their ace. Too bad they chose a clown to lead their stupid play. This kind of disruption used to work in the old days not anymore. Why they thought a betrayal by an insider would work is a little strange. The reason they are copying from an old play book shows how lazy they have become or how they relied on the dead gangster kingpin for ideas is becoming clearer. They thought we forgot Ledetu? Hey Woyane that play was done eight years ago. Molla Asgedom is old news. The new method is celebrating our new found strength and marching in a straight manner to finish the job we started. It is refreshing to see our people are watching the ‘interview’ by the fake General for entertainment not news. We suggest they de-lice his head before they bring him out next time. It is very distracting to see a grown up person scratching hair mite itches on national TV. Go wash your hair dirty Woyane and while you are at it rinse your little brain with some Ethiopian pride and manliness. Unlike Woyane gatherings we really did not have anything to offer our guests other than the promise of hard work and sacrifice. We do not own any land to distribute, we do not have any Bonds to sale nor did we have condominium to give out. The folks that came to celebrate with us did not have to hide or feel the burning shame of being seen with Woyane dogs. I am proud the folks that come to our events walk up straight with their heads high and wear the flag with pride and not use it to hide the shame. As for the people of the bay Area we are on a different zone today. It feels great to do something good without expecting anything back for oneself. Our struggle is about the health and well being of our people and country not a selfish act to enrich oneself. We give because we love our country. Our fighters sacrifice not to take over power and lord it over the rest of us but clean the house and make it ready for all of us decide the living arrangement. We were so overwhelmed by what was done in Oakland that we have decided to do the same in San Jose. Stay tuned for part II. Long live Ethiopia and May God protect our freedom fighters.